Robert Bowmer was involved in an accident on the A96 Inverness road near Forres Enterprise Park. A Moray man who dedicated himself to the community has died following a horror road crash. Police have confirmed that Robert Bowmer, who was better known as Tony, was killed after being involved in an accident on the A96 Inverness road near Forres on Thursday. Yesterday, neighbours and friends of the Alves resident paid tribute to the keen golfer who was a regular visitor to Forres Golf Club. An appeal for witnesses has now been launched as police attempt to establish what caused the fatal collision. The 61-year-old was the long-term treasurer of the Moray Federation of Community Halls and Associations and supported treasured venues across the region. The electrical part-tester regularly offered his handyman skills to halls and helped support fundraising lotteries to give the buildings a future. Last night, group chairwoman Anita Milne said Mr Bowmer’s death would affect people across Moray. She said: “He did a huge amount for the federation and was very supportive of all the work that halls did for their individual communities. Mr Bowmer, who was originally from the north of England, also helped community groups develop websites to promote their own initiatives. Neighbours of the electrician spoke of their shock at his death. One said: “He moved here about three years ago and over the last year or so we had begun to know him. He was friendly and talkative. 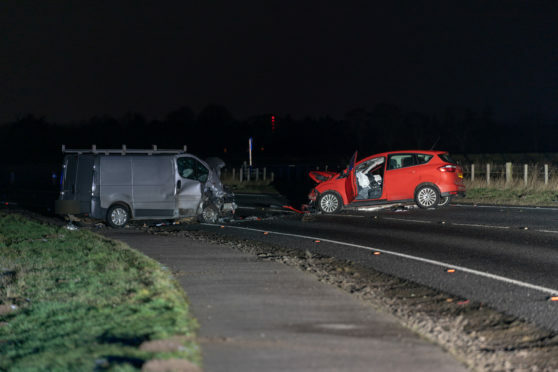 Emergency services were called to the five-vehicle accident near the Forres Enterprise Park shortly after 5pm on Thursday. Mr Bowmer was airlifted to Aberdeen Royal Infirmary from the scene. Three other men who were taken to Dr Gray’s Hospital in Elgin have since been discharged. The Alves resident was driving a red Ford C-Max at the time of the collision. Police have appealed for information from anyone who saw the vehicle before the accident.